Sometimes (sometimes? Most of the time!) I get too caught up in my little thoughts and worries to notice the beautiful world around me. I did an eleven mile walk this morning and when I got home I realized that I hadn't seen a thing! I am committed to taking a (good) photo every day to post to my blog, but more than two hours outside and - nothing! 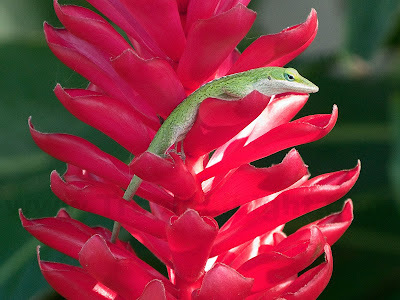 Luckily, on a ginger plant outside my front door I noticed something green on the red flower. This little lizard was so content lying in the sun that it allowed me to take a photo before scooting off. Thank you little guy. Don, how lucky we are that we need only open our front doors to get a shot like this one!LOOK at his face! looks like hes saying.."OMG Papparazzi! "I look forward to ur daily shots of the beauty around us. Your photos are truly truly beautiful!